David Harris practices where he lives, as a proud resident of San Antonio’s blossoming Southtown and King Williams neighborhoods. David moved back to San Antonio to practice law after leaving the city to go to law school at Baylor. Before that, he graduated from Trinity University and grew up in Houston, Texas. He has been with The Barrera Firm since 2011, when the attorneys of the firm were looking for another Baylor lawyer to join their ranks. After he’s finished working on Clients’ cases for the day, you can find David biking or kayaking down the San Antonio River’s Mission Reach, or volunteering at the Beethoven Manenchoir on First Fridays. He is also a member of San Antonio’s Leadership Organization of Professionals (LOOP) and the San Antonio Young Lawyer’s Association. 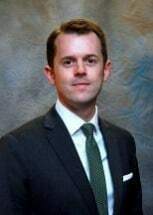 David graduated from Baylor Law School in 2011, where he was a semi-finalist in the Dawson & Sodd Moot Court Competition and was a member of the Order of the Barristers. He also attended the Institute on World Legal Problems in Innsbruck, Austria taught by United States Supreme Court Justice Samuel Alito, and interned in the chambers of United States District Court Judge Fred Biery. He graduated from Trinity University with a Bachelors of Arts in Political Science.